If I have a bad day at work, I always consider the fact that, as my mum always said, ‘there is always someone worse off’ and sure enough, there always is. For instance, I like to imagine that somewhere, in a galaxy, far, far away there is somebody responsible for the intranet on the Death Star. That must be the worst intranet job in the universe. What would the top tasks on the Death Star be? Find a stormtrooper? Find a droid? The Death Star canteen menu? Suggested names for their intranet? – ‘The Force’, ‘Dark side’? I suspect that the homepage would be dominated by Empire news, and internal ‘social media’ would not really be allowed. Would they be using SharePoint in a galaxy far, far away? I guess probably they would, everyone else seems to be. This might explain how rebel spies got the plans to the Death Star, user permissions were set incorrectly. I wonder how they handled the business case? Given they can afford to build a massive battle station, the Empire obviously have some cash to splash around. Though maybe this leaves them heavily in debt. Imagine giving a presentation to the Exec team. That would be a little stressful. What would be the key drivers for further development? What is the Empires strategy? Would there be any HR challenges? 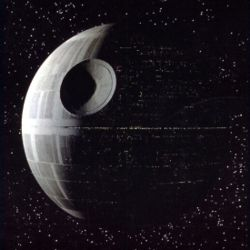 I am guessing initially the focus for any developments would be to support the Death Star being fully operational. All those new processes and information for people, which floor is such-and-such department on etc. Would a better social platform to share knowledge have highlighted the fatal flaw in the designs of the exhaust ports? This alone could have sold the business case to the Execs. I am guessing the building of the Death Star would require external contractors. Would they have access to the intranet? If so, presumably mobile would be a big requirement as well. I don’t recall seeing too many desktops on the Death Star. Would the intranet be cloud city hosted or hosted on site? Would the internal Comms team run regular #AskVader tweet jam sessions? Would Vader actually blog? Employee engagement would be important if the Death Star is to be fully operational. Leadership communications would be vital. ‘So, just had a meeting to discuss progress on finding the missing Death Star plans. After some heated discussion we agreed the present course of action should continue. Unfortunately, Admital Motti left the meeting early, he wasn’t looking too well and has a suspected throat infection. Probably best not pointing out that Force choking is not a standard form of moderating social media. Ah, sometimes I forget how easy my job really is. Do you think there is a worse intranet job out there? Let me know in the comments below. Dan as a child of 77 I was literally born and raised through the star wars era. Now I find myself working for Attollo Intranet and you have just merged these two topic brilliantly. Great work Sir – May the Force be with you! Darren, glad you liked it. I grew up with the original Star Wars movies as well and so this seemed like it needed to be written.